Start your weekend off the right way with these crispy-on-the-outside, fluffy-on-the-inside, gluten-free sweet potato waffles. Yes, it's true, these waffles are made with nutrient-dense veggies and can even be made in under 15 minutes. This delightful breakfast, created by James Won, author of the new cookbook 10-a-Day the Easy Way, is made with sweet potatoes, which have immune-boosting properties, and carrots, which are high in vitamin C and known to support the health of your skin and eyes. Depending on whether you're looking for a savory or sweet treat, you can top your waffles with more veggies like avocado, tomato, and onion or opt for a sweeter touch with apples, blueberries, and kiwi. 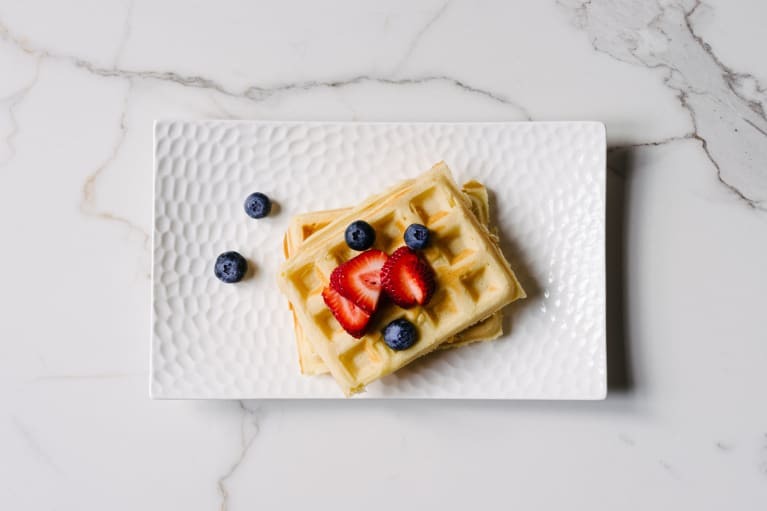 Won recommends adding a little extra healthy fat to the waffle toppings to "significantly boost the absorption of the heart-healthy carotenes in the sweet potato." This could be olive, avocado, or coconut oil, nuts, or peanut butter. There's nothing better than indulging in a yummy breakfast classic without having to worry about the post-breakfast food coma. These light waffles will give you the energy you need to get out the door and enjoy the day! Blitz together all the ingredients except the carrots in a food processor until smooth. Transfer the mixture to a bowl and gently fold in the finely grated carrots. Spoon the batter into the waffle iron to make 4 waffles. Cook over high heat for 4 minutes on each side if using an old-school iron. If you are using a fancy electric one, these timings may vary. Based on excerpts from 10-a-Day the Easy Way by James Wong with the permission of Octopus Publishing. Copyright © 2019.